Giving a lifelong Weymouth fan an A-Z of the UK would be as useful as giving a slug a drivers licence. 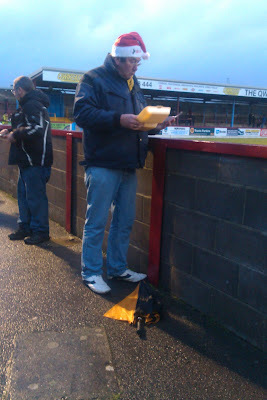 Years of lower league toil means that every Weymouth fan can provide you a six figure grid reference for any town in southern England. This Christmas one old village foe rolled into town, Bashley ( SZ240973) I've been there. It's basically a petrol station operating a neighbourhood watch scheme. A place so remote if you enter it into your Satnav and that woman's calm voice barks "I'm not faakin go there you buffoon" before an overwhelming weeping noise fills your car. Just the 15 (fifteen) different types of sauce then. 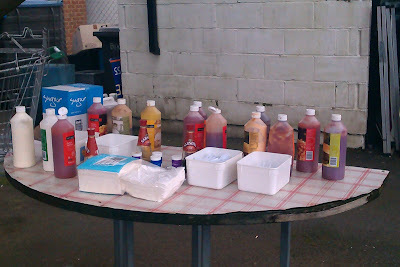 Condiments table as previously seen on Adventures in Tinpot. Our geographical knowledge was extended by the arrival of a new opponent. We've never played St. Neots Town at home or, to give them their full name, St. NeotsitssomewherenearCambridgeithinkisntit. 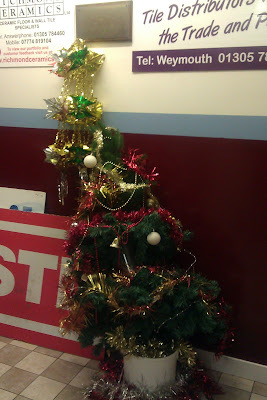 Weymouth are entering the festive period on the up. We've been so far away from the up in previous seasons powerful binoculars and an underwhelming green laser light borrowed from the seafront was no help in locating it (gag for the locals there. Them lights hey, hey). Our current place on the up was secured due to four wins in a row and, more importantly, we're finally rid of the Ghost of Quiches Past, George Rolls. George left to focus on his attempt to become the first man in history to have hair greasier than a three bird roast from Iceland. 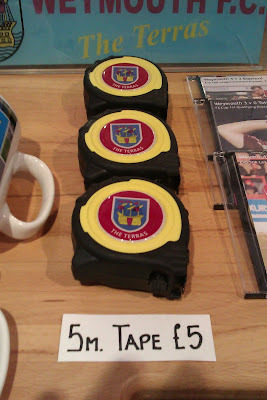 Weymouth FC tape measure. Great value at £1 per metre. The club is now being led by fans and the fact these Christmas games take place at all is thanks to the superb efforts of a green fingered bunch of volunteers. A doff of the novelty flashing Santa hat to you all. *opens text message* Hi Dave, hope you had a safe journey. I hope you're not wearing that ridiculous Santa hat and eating more chips. You know you are suppose to be on a diet. LOL. PS, the petrol station is fine. There's an sense of optimism engulfing the club. It's odder than the popularity of the TV show Mrs Browns Boys. After the last few seasons of inept performances, relegation battles and broken promises of home made buffets like the feeling of being an optimistic Weymouth fan. A lot. I've forgotten how to be optimistic, how to travel to a game expecting to see Weymouth compete for 90 minutes and maybe even see them win. 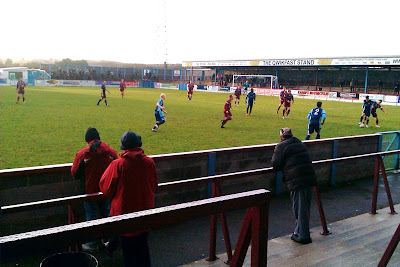 180 minutes later, Weymouth have six more points and are now in the play offs. Bashley are sent back to man the pumps and sell out of date pasties to lost HGV drivers and a disorientated St. Neots are sent back to wherever it is they come from. Bashley were beaten one nil. A scrappy win, a battling performance and a game that would have been lost last season. In amongst that though were bits of great football, fluid passing moves and no little team spirit. St. Neots went a goal up. Last season this would have seen panic set in, defenders would run around like squad players from Super Cup football low on batteries and heads would be dropping quicker than at the Guillotine World Championships in France 1793. Not any more. Oh no. A great free kick from Scott Walker, a jinking run and well placed finish from Mark Ford and a header from Sam Poole gave us a 3-1 victory. The defence looks solid. There's no need to panic like every time the ball gets hoofed into our half. The defenders have positional sense and a midfield that offers them protection. Ed Palmer looks like the brute defender any half decent non league side needs, a man ready to clatter that pesky nippy centre forward before removing the strikers leg from his shin-pad and calmly stroking the ball forward/belting it as appropriate. Ashley Wells is Steve Tully (the sweeper era) Light and Barry McConnell is older than last year's squad put together. This is a good thing. It brings the experience, organisation and leadership that we previously badly lacked. 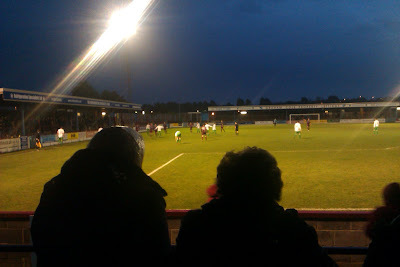 Token St. Neots Town match shot. The midfield isn't afraid of a battle, it won't be bullied into hiding. Dan Clay is always available for a crunching tackle or creating space from which to play a simple pass. It's also a midfield with no little skill either and a goal scoring midfielder in Craig Duff, who got the only goal against Bashley. 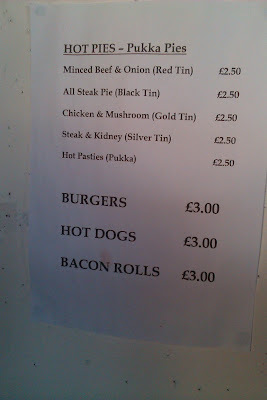 For those of you who have been writing in to ask what colour a Pukka Steak and Kidney Pie tin is here is the answer. Up front though. Crumbs. It's been a while since we've had a player trouble the league top scorers list. Now we've got two. Ben Joyce and Mark Ford never stop making purposeful runs or harassing defenders. They seem to have a great understanding and, Ford in particular, possess a calmness in front of goal that's been lacking since Stuart Beavon left. Two blue tins and a pink tin please. What? Think I'm making this all up. OK, well how about this then: The Babs stood and applauded the players off. Scary stuff. It's been a long time since watching Weymouth was this much fun. The pride of being a Weymouth fan was always there and it's finally complimented by watching a competitive team playing entertaining and exciting football. 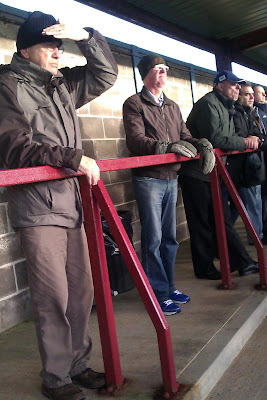 2013 could finally be a good year to be a Terras fan. For photos and videos of the Bashley game click the internet mouse here. For some proper photos of the St. Neots Town game headover here. There awesome matches to watch in Weymouth. We love seeing a great game during our stays at Weymouth holiday cottages. 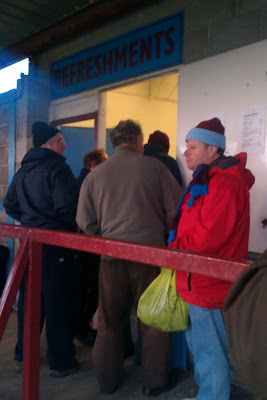 Fancy becoming Weymouth FC Manager? Barcelona - Champions League celebrations special. Aye up think twice, it's just another day for you and me in paradise me duck. AiT updates to your email?